Fishcakes are one of those perfect go-to choices. Fussy kids love them; they’re incredibly economical because they really stretch a teeny-weeny bit of protein; and they’re ideal for utilising that leftover mash that invariably ends up in the bin if not used fast enough. At it’s simplest it is of course just flaked fish mixed with mash, then dipped in egg and breadcrumbs before they’re pan-fried. Nothing wrong with that, but why settle for less, when you can so easily have more? 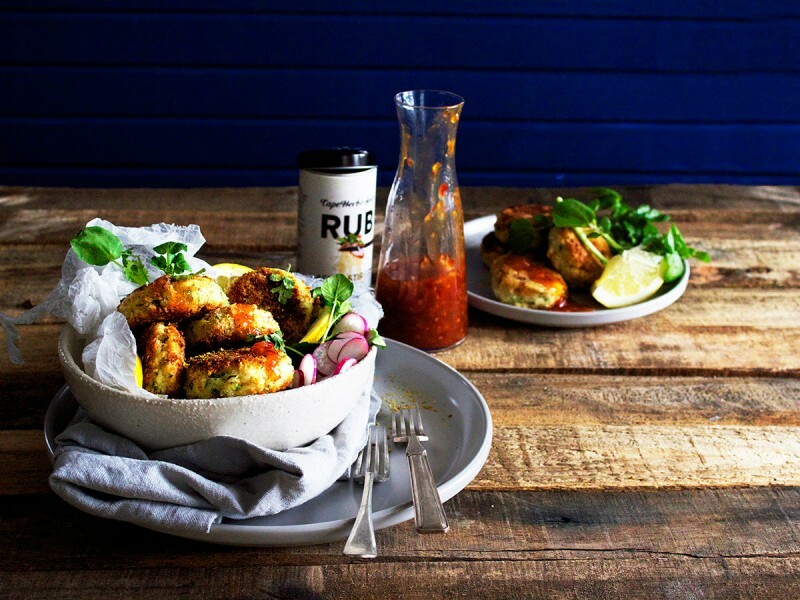 Think Thai fishcakes bursting with lemongrass, lime, ginger, chillies and other good stuff. Cape Herb & Spice’s Asian Stirfry seasoning is the answer. A liberal dash of it turns the humble hake fishcake into something much more interesting. Serve it with sweet chilli sauce and herby green salad simply dressed with a dash of olive oil and a squirt of lime. Fast. Fresh. Yum. Peel potatoes, quarter and boil until soft. (NB: do not add any salt when you boil the potatoes as the Asian Stirfry seasoning contains all the sea salt you’ll need.) Once soft, drain in a colander and leave for a few minutes to dry. Mash the potatoes. Steam the hake or pan fry, then flake it, taking care to remove any bones and skin. Dip the fishcakes in flour, then the egg and then the breadcrumbs. Preheat a non-stick pan, add a dash of oil and panfry the fishcakes until golden on both sides. Serve straight away.